Our creative writing books by author Christopher Edge will give your aspiring authors all the support they need to invent incredible stories. 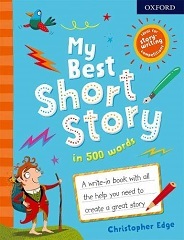 A new must-have write-in book for kids to put down their ideas, set the scene, choose their characters, and craft the best short story in 500 words! With colourful illustrations throughout, it has prompts and ideas for building plot, action, characters, scenes, beginnings, and endings. Top tips from Oxford word experts are included to further your child's creativity and writing skills. 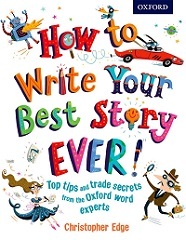 This authoritative book from the word experts at Oxford will help children aged 11+ to turn their ideas into gripping and powerful stories, with examples and tips from the best-known authors to show them how it's done. Practical tips cover all the key elements of plot, characterization, building a believable world, thinking about tone and style, weaving description into stories, and editing their work. Information on sharing stories and how to get people reading their work is included. This is a humorous and authoritative book that will awaken the author in every child, unlocking their story ideas and giving them hints and tips to create their own stories. 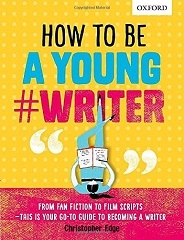 For children aged 13 and under, this book is written in a fun, engaging, and inspirational style that will help all readers to see themselves as writers and help them to achieve their creative writing goals. It is ideal for home and schools, primary and lower secondary. Set the scene, draw your characters, and put a twist in your tale with this new, must-have notebook that will inspire children to get creative and start writing. Created to work with How To Write Your Best Story Ever! 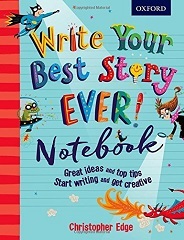 by Christopher Edge, this notebook contains further hints and tips and is the perfect place for budding young writers to gather the ingredients for a great story. A fun and practical step towards creative writing that no child should be without.